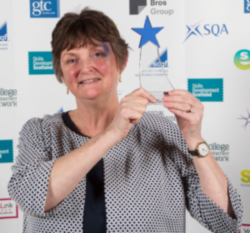 The three programmes – the Glasgow School-College Inclusion Programme; the GCC Lifelong Learning Centre; and the introduction of a new Higher National Diploma in Counselling – were all named winners at this year’s SQA Star Awards, which were presented at a glittering ceremony in the city’s Kelvingrove Art Gallery and Museum. In partnership with Glasgow City Council, Glasgow Clyde College has championed the Glasgow School-College Inclusion Programme, which sees young people from across the city who are disengaged with the traditional school environment undertake SQA qualifications at the college. 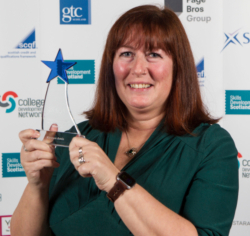 The programme team were presented with SQA’s Promoting Inclusion award, and also received SQA’s Pride o’ Worth Award – the top award for schools and colleges delivering SQA qualifications. The college was also recognised for its Community Learning and Development team’s (represented by Sheila White at the SQA Star Awards, pictured r) work offering literacy, numeracy and language courses to parents, for whom English wasn’t their first language, or who had previously had difficult experiences with school and formal learning, so they can play a more active role in their children’s education. Alan Milson, Community Learning and Development Officer, says that gaining a recognised qualification is encouraging many of the learners to consider taking their education to the next level. For Kerry, the initiative has given her the confidence to pursue her ambition of becoming a teaching assistant. Teaching staff at the college were also recognised by SQA, as senior lecturer Kirsten Amis (r) was named SQA Champion for her work developing a new Higher National Diploma in Counselling.